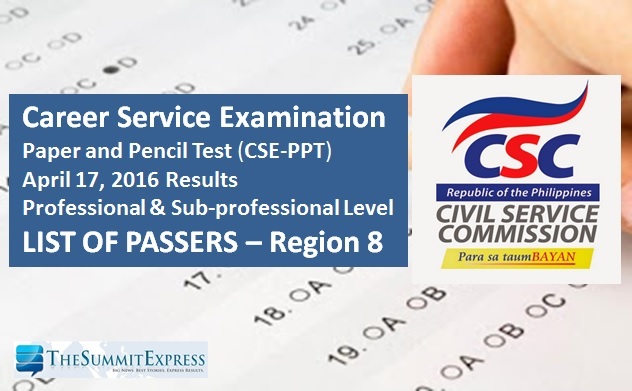 The Civil Service Commission(CSC) releases results of April 17, 2016 Civil Service Exam - Paper and Pencil Test (CSE-PPT) known as the career service exam. A total of 558 examinees passed the professional level and 30 hurdled the sub-professional level tests in Region 8 (Eastern Visayas). Below is the full list of successful examinees for Region 8 (Biliran, Eastern Samar, Northern Samar, Southern Leyte) civil service exam (CSE-PPT) professional level and sub-professional level. 255 08 316216 DULFO, ERICA O.